I had my palm read once years ago. It wasn't really an official palm reader. It was a friend's neighbor who had read a book about it. I don't even recall what she told me other than I needed to eat more green vegetables because I had white spots on my fingernails. I've never really been comfortable with people telling me my future. I don't believe you can predict someone's future other than the obvious...you will eventually die. It's all of that other stuff in between that I don't really buy off on. I have given up on the reality that anyone can predict the future. This is not to say that I don't believe in probabilities based on either research or experience. When I write something new in my blog, I generally figure that there is a high probability I will offend someone. Because humor is one of those things that is subjective. And I'll be the first one to admit that my sense of humor is a bit skewed toward sarcasm and my own sense of the absurd. Pollsters make a living on the probability of people's behavior based on the laws of average. This opens up a whole new can of worms (and have you ever actually opened up a can of worms? ), especially when the polls are wrong. I lean toward the school of thought that most psychic predictions are based on intuition. And intuition is based on picking up subtle (and not so subtle) clues from everyday life. I consider myself an intuitive person. I can generally immediately tell when I've said the wrong thing within seconds of the words leaving my mouth. Middle age and experience has unfortunately not tempered my ability to intuit things are wrong before they leave my mouth. This is why I prefer writing to talking. But sometimes I even write before I think. And what has inspired this runaway train of thought? I ran across the photo (above) of a plastic coconut palm I took on our honeymoon last April in Cabo San Lucas. We were sitting on the second floor of a restaurant and I spied the fake tree on the street. It struck me as ironic at the time that we were in a semi tropical environment that one could likely expect to find real coconut palms. And we would have been in our rights to expect to see palm trees. But since most of the palms had been cut down or killed off to make way for tourists, there were none. 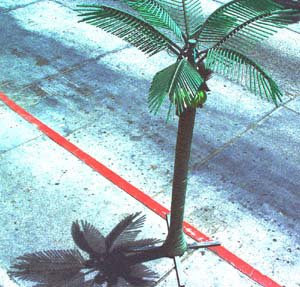 So some enterprising restaurant owner improvised and stuck a portable palm tree out front on the concrete. I kind of liked the photo and have never really found a use for it before, so I posted it. But in the past I've posted random photographs and have been greeted with quizzical silence as to what the purpose was. So, predicting people would expect a purpose for posting the photo, I invented one. It struck me that an artificial palm tree is kind of symbolic of a fake fortune teller or palm reader. It's funny how my mind works. Funny indeed, enjoyed the post. Thanks, still searching...I suppose I should have predicted that you would stop by, but somehow I missed it. But I am glad you enjoyed it! I had no problem knowing that you'd find irony in that fake palm tree in a tropical location. And I totally understand how your mind works. Pretty much like mine. Sorry. I know what a shock it must be. Don't worry. I adapted. So will you. When you open that can of worms it's as if five cans worth comes exploding out. We tell our stories and are ourselves hoping not to offend. Some times I do just write and think later or too late. I'll just say I'm sorry now. Nice post! You couldn't have known this of course but it so happens that a horde of rampaging fake coconut palms killed my grandmother. It was horrible and my family has had a vendetta against all fake coconut palms ever since. However, I do not take offense at your post. Quite the contrary, you have inadvertantly revealed the location of my enemy and I can now avenge my families honor. I have several photos that I am dying to post. I'm just waiting for something to happen in my life that will be fitting of the photos. Now is that WEIRD or what? If something did happen, would that be a self-fulfilling prophesy? Thanks for the words of comfort. Great minds....! Are you predicting that I will soon be raising goats? Teri, Your unihibited honesty is one of your most endearing traits. Let the worms wiggle where they fall! You and the Monkey Playing Cymbals indeed have many things in common. I'm sure you left no fround unturned in your search for the artifical palm. I'm glad I could help you with that. Shandi, I think all dreams have the potential to be self-fulfilling prophesies. We'd have no art unless artists pictured something in their minds first and then made it happen. I'm looking forward to seeing those photos. I've never eaten an earthworm before. I'd like to but I'm afraid of pesticides and my local market doesn't carry certified organic earthworms. I should ask the manager one of these days if they could stock them. Technical Remote Viewing has provided a repeatable process which has been demonstrated to "predict" near future events better than 50/50.